On the Caribbean slopes of the Talamanca Mountains, Parque Nacional Barbilla was created mainly through the efforts of the Fundación Nairi and is supported by INBio which continues to operate the Estación Biológica Barbilla within the boundaries. Part of the Talamanca/La Amistad Biosphere Reserve. Traditionally the home of the indigenous Cabecar group this is one of the least visited of Costa Rica’s national parks and mainly protects tropical lowland rainforests (although Cerro Tigre a.k.a. Barbilla climbs to 1617 meters). Rugged hiking trails are the main attraction in the park roughly following the Ríos Dantas and Barbilla. 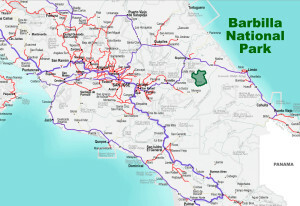 Barbilla National Park covers 11938 hectares. Elevations range from 500 to 1617 meters (1640 to 5305 feet).